Video poker can be one of the best games for players offered by real casinos (the faux video poker in racinos should be avoided). However, not all video poker is the same, and the bad games can be among the worst, as can the better games if not properly played. This post lists (and explains) some of the common mistakes I’ve seen video poker players make – mistakes that can cost a lot of money. What I can’t do in this post is explain the proper strategy for each game. That you have to learn on your own. If you choose to, you will be rewarded both monetarily and, I believe, with greater satisfaction and enjoyment when you play. I recommend starting with jacks or better, which is one of the more popular games, and on which many other games are based. Wizardofodds.com has everything you need to teach yourself the right way to play jacks or better and most other video poker games. 1. As stated in part one of this post, many players assume all machines offering the same game at a given denomination are the same. In a grocery store, all one quart cartons of the same brand milk sell for the same price. In most casinos, this is not the case. A 7/5 jacks or better machine often sits next to a 9/6 machine. The pay table is the price tag. Don’t be the person playing the 7/5 machine. Vpfree2.com can help you find the games with the best pay tables. Don’t ever play on a machine with less than the best pay table for that game and denomination in that casino. 2. Most video poker machines allow you to play one to five coins. Given the same game and pay table, many players wrongly assume the odds are the same whether they play one coin on a $5.00 machine or max coin on a dollar machine. However, a close look at the pay table below (the vertical columns show the payoffs -which include return of your bet – for each hand with one, two, three, four or five coins played, respectively) shows that the royal flush at max coin pays a large bonus – 4000 units, as opposed to 1250 without the bonus. A one coin royal on a five dollar machine would pay only 1250 (250 shown at the top of the first column times the five dollar base unit). I know of no video poker machine that does not offer at least one payout bonus for max coin. You never should play video poker for less than max coin. If you can’t afford to play a game at max coin, find a machine at a lower denomination that you can afford to play at max coin. 3. Don’t assume that the strategy for one game is the best way to play any other game. 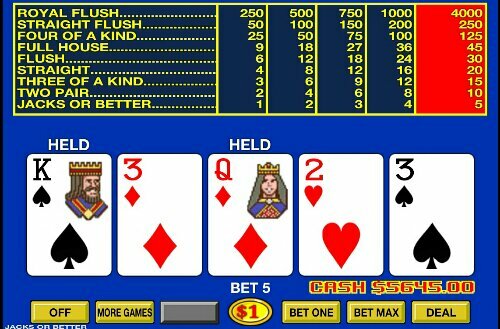 The optimum strategy for any video poker game is calculated based on the pay table. Any difference in the pay table requires a different strategy for optimum play. For some games, using the optimum strategy for a different game is not a huge mistake, but for others, it is. Don’t play games you don’t know how to play. They are not all the same. 4. Don’t assume that the pay table on the game you played on your last visit to the casino hasn’t changed. Casinos often change pay tables and move machines without giving notice. Even if a machine you played on a prior visit looks the same, take a minute before you start playing to make sure the pay table hasn’t been downgraded. And be sure to check the payouts for all hands, not just the ones that usually are changed, such as full houses and flushes in jacks or better. This entry was posted on Thursday, January 9th, 2014 at 1:11 am and is filed under Consumer issues, Gambling. You can follow any responses to this entry through the RSS 2.0 feed. You can leave a response, or trackback from your own site.